#dailyselfie – coconut water? bleck! i was on my way to the produce section of disco kroger last week when i passed by an end cap full of zico coconut water. i feel like i’ve been seeing coconut water everywhere lately! it’s the new “in” thing. there are commercials for it left and right it seems. even beautiful jessica alba is promoting it. their branding is so clean and coconut water just sounds so refreshing that i figured i’d give it a try myself. if it’s good enough for jessica, it can be good enough for me! yes? heh, hardly. 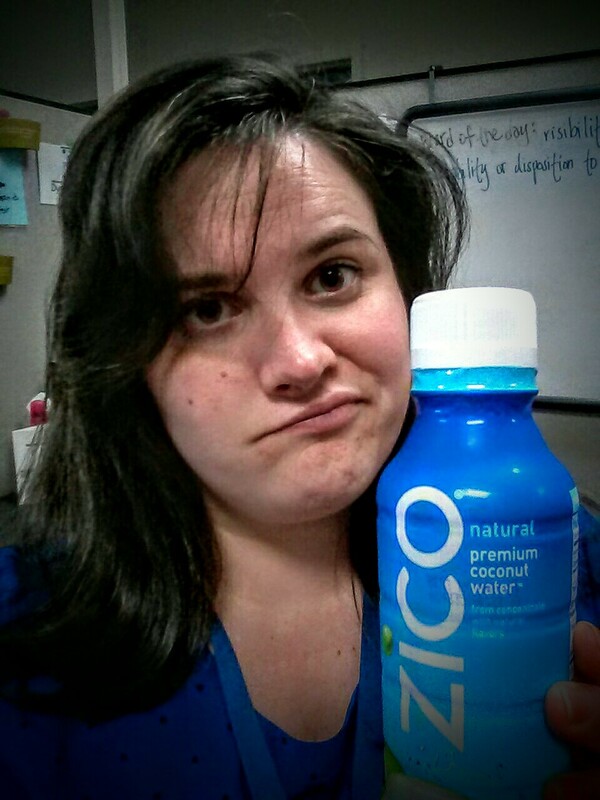 the cold reality of my experience with zico coconut water is that i didn’t like it one bit. it’s not thin like tap water, which is what i expected, and almost has a slimy texture. harsh, i know, but wait til you hear what i have to say about the taste: i was completely prepared for some coconut flavor, which i quite like in subtle moderation, but i was harshly mistaken. the standard zico coconut water tastes like salt water and pool water combined, not what you want to be chugging down on a hot summer afternoon if you ask me. i tried with all my might to drink it all and drink it quickly, but i was only able to put down a third of the bottle. perhaps i need to try one of the flavored coconut waters? maybe that will help? maybe, but until someone i know happily backs this beverage, i’ll be steering clear.